LoggerNet Server-SDK is a flexible and powerful programming tool that creates innovative client applications for communicating with our data loggers. LoggerNet Server-SDK can be used as a stand-alone product with full functionality. LoggerNet Server-SDK can also be used to customize client applications that extend an existing LoggerNet installation. However, the software package LoggerNet-SDK can also be used for this purpose and may be a better value when extending an existing LoggerNet installation. LoggerNet Server-SDK includes ActiveX controls that encapsulate some of the fundamental tasks users want to perform with our data loggers. It also provides the entire LoggerNet Server communications DLL that supports data logger networks and any of our telecommunications links. 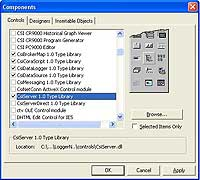 The developer must create all of the clients that will start, stop, and administer the included LoggerNet Server DLL. LoggerNet Server-SDK supports any data logger that can be supported by the LoggerNet server. It is compatible with the mixed array, PakBus®, and TD data logger operating systems for the CR510, CR10X, and CR23X dataloggers. This patch upgrades LoggerNet Server SDK 4.0, 4.1, 4.3 and 4.4 to version 4.5. How can a data table on the data logger be deleted using the simplepb.dll library? This can only be done by sending a different program using the FileControl() or File_Send() instruction. Data tables in a data logger cannot be added or deleted at data logger runtime using any of our data logger communication software, such as LoggerNet, PC400, PC200W, or any of the SDKs. Changes (additions, deletions, or modifications) to data tables within a data logger have to be changed inside the actual data logger program using a program editor such as CRBasic. After the data tables are modified within the program, the program must be resent to the data logger. Compiling the new program on the data logger will reset and create new tables as defined by the program. To clear a data table (zero out the data), the CoraScript control, found in either the LoggerNet-SDK or the LoggerNet Server SDK, would need to be used. This functionality does not exist in the BMP5 Direct SDK. Using the BMP5 Direct SDK, how can data be queried from a data logger starting at time1 and continuing to time2? This is not supported in the BMP5 Direct SDK. The options available are to specify a starting record number, get the most recent record, or collect all available records. When specifying a starting record, all data from that record forward is then retrieved. The burden is on the programmer that uses the SDK to keep track of the last record number retrieved within the program and then to retrieve what is needed or desired in the future. The functionality to specify a date/time data collection range is available in the LoggerNet-SDK and the LoggerNet Server SDK. Both the LoggerNet-SDK and the LoggerNet Server SDK are available for purchase from Campbell Scientific.